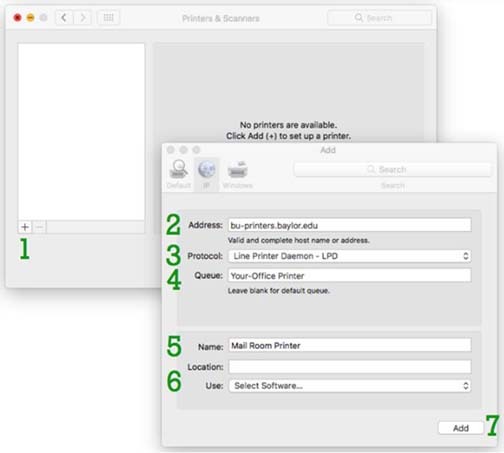 In order to add a printer to a computer running Mac OS X, open the Print & Scan control panel in System Preferences and then follow the steps below. Click the + at the bottom left of the printer list. Set the Queue: field to the printer queue you would like to add to your computer. If you do not know your printer queue please contact the HELP Desk. Set the Name: field to a descriptive name that will help you distinguish this printer from others you might have installed. Set the Use: field to correct printer driver. If it does not detect the driver automatically select Select Printer Software. This will bring up a separate window with all of the installed printer drivers on your system. If you cannot find your printer model in the list please contact the HELP Desk. Click Add. Clicking Add will bring up a list of installable options for the specific printer you are adding. You may need to select installed options such as whether or not the printer has a duplex unit installed.